Mien ga is now one of my favorite Vietnamese comfort food. My mom makes mien ga with shredded chicken, chicken gizzards, black fungus, and plenty of ground pepper. The show stopper is really in the simplicity of the broth. With the right amount of salt, sugar, fish sauce, and ground pepper this soup really prove that less is more. I actually don't remember liking this soup as a child because I always feel the noodle is just too mushy. My mom has the habit of cooking the noodle right in the broth. Her method does save a lot of time but the noodles will always be overcooked. My dad feels overcooking the mien noodle will ruin this dish, and I couldn't agree more. For best result soak the noodle in warm water for about 15 minutes. Once you pour hot broth over it, the noodle become perfectly al dente. Like basil is to pho, sawtooth herb is unique to mien ga. I couldn't find any sawtooth herb in my area so I just have to settle with a lot of cilantro. This soup is mmm...mmm...good, eat your heart out Campbell's chicken noodle soup! 1. Trim the chicken fat to your liking. 2. Cook the chicken in the water to make a broth. Remove any scum. 3. Once the chicken is fully cooked then remove from broth. 4. Season the broth with the remaining ingredients. Add more or less to your liking. 5. Sauteed the black fungus with green onions, fish sauce, and ground pepper. You can actually add this to the broth but I prefer to add them separately. 6. Shred the chicken into smaller pieces or you can cut the into smaller portion. In a bowl add noodles, chicken, sauteed black fungus, green onions, and cilantro. Pour hot broth over the noodles and add freshly ground pepper on top. Enjoy! I totally agree with you there, I much prefer "ga ta". If you have access to cornish hen, you should defintiely try it because the meat is more firm and sweet. Thuy you are awesome :). I was looking for a site that had a bunch of Vietnamese food recipes. Do you have a recipe for Banh Nam ? Thanks for stopping by Khuong and please come by again! 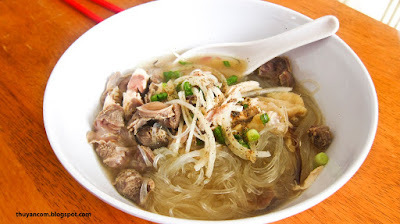 Our family has always eaten Mien Ga with Ngo Gai, it may be a regional preference.